After receiving the lovely Nails inc Diary for Christmas I thought it was only right to try out some of the polishes that came with the gift set. Trying to choose one polish out of twelve was a difficult task when each one was so desirable ( if only we had been granted with twelve fingers) after reading up on each shade I reached a decision ( drum roll please) and chose Baker Street a royal blue shade that's complement ready! As much as I love my berry reds in winter sometimes a different uplifting shade can be a pleasant change as Baker Street defiantly delivers I don't see why not. As per usual I used my Essie base coat and Seiche Vite top coat to create the stunning mani as it wouldn't be any good with out them.The polish was pleasant to apply and gave me the perfect mani that was a change from my usual winter polishes. The polish is defiantly a must buy and is perfect anytime of the year. Also a fun fact to share Beyoncè rocked this shade after giving birth to Blue Ivy so if it's good enough for Beyoncè then I can't possibly see a reason why we shouldn't be wearing it either. I now can't wait to start trying the rest of the shades that I received in my nails inc diary. Do you own Baker Street? Baker Street is one of my favourites! 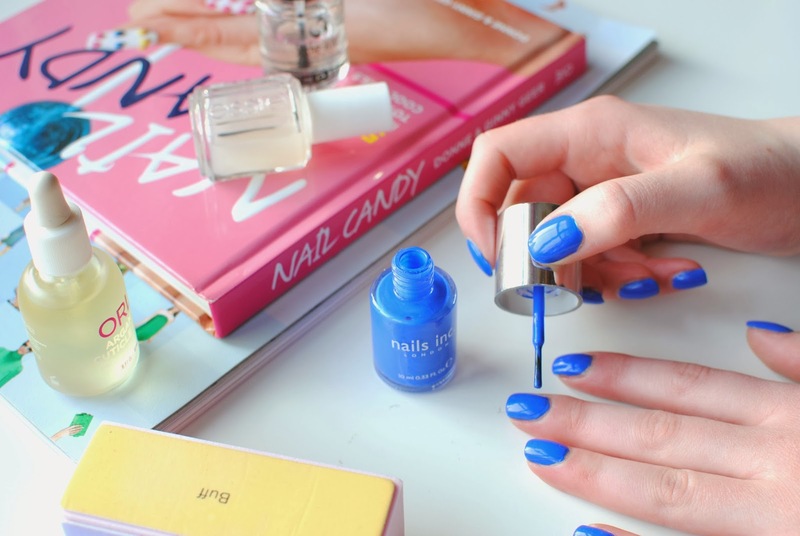 Such a gorgeous shade, sometimes blue can be wuite hard to pull off but I think that this can suit everyone! This colour is gorgeous. I love blue nails! Everyone has been talking about this Nail color and I'm dying to try it! This is such a pretty color for you and it suits your skin tone well. I'm into a lot more pinky-bright shades! I've been dying to get my nails on this but I'm not too sure if I want to purchase it just yet. My nails are like whatever for me and I always forget to take extra good care of them...but when you're in college you can care less about your nails sometimes lmao. when I'm at school i never have the time to paint my nails. i have a bad habit of painting one hand and leaving the other, not a good look you should try it. I really like using the shade as well. I find that it looks lovely on the toes during the summer too! I love Nails Inc. that is so a cute shade!